Nut trees are an edible plant that many people don’t think about planting in their yards. There are several less known nut trees but today I will focus on some of the better known. Plan before purchasing and take into consideration mature size. Nut trees require full sun and well-drained soil. For some, you may need to plant two trees for pollination. Filberts and hazelnuts grow on 12 – 20′ trees depending on variety and how they are pruned. Hazelnuts and filberts begin producing in 6 years. The names Hazelnut and Filbert actually refer to the same tree and nut. Two trees of different varieties are required for pollination. Almond trees look much like a peach tree, grow 12-20′, and begin producing in 3 or 4 years. 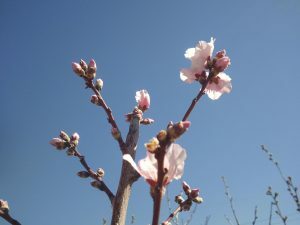 I first planted almonds after hearing that they should grow anywhere that a peach tree will grow. I never lost a crop until the magpies eventually figured out what delicious edible nuts were growing on the trees. In addition to the nuts, almonds have beautiful spring flowers. In most cases two different varieties are required for pollination. Walnuts are much larger trees (40′) so considering mature size is especially important. It may be many years before your walnut tree is old enough to produce so the sooner you plant the better. Also, walnuts contain a substance (juglone) that is toxic to some plants. Lawn will grow near a walnut tree although I would recommend keeping a space of at least 3′ in diameter between any tree and a lawn area. Some other plants won’t do so well so you would want to research and avoid planting sensitive plants within the drip line of the tree or using the walnut leaves as mulch on such plants. I love nuts and have often made spiced nuts at Christmas time. I was seeing recipes for Crockpot spiced nuts and thought I would try this method instead of the oven. I also found recipes for using different seasonings to make a spicy rather than sweeter type. I made two batches – a sweeter one in the Crockpot and the spicy in the oven. I changed each recipe a bit. I didn’t see how using the Crockpot was less work so the advantage I think more is if you don’t want to heat the house with your oven. Maybe there is also less chance of burning the nuts. Trying a different mix of seasonings has caused me to want to experiment more with other types of flavors. However, next time I will just use the oven. I used Brazil nuts, walnuts, and cashews this year. I have used almonds and pecans in the past but not peanuts. Whatever your preference is should be fine. Lightly butter the bottom and half way up the sides of Crockpot. Mix sugar and spices, set aside. Mix egg white and vanilla then mix with nuts. Add nuts to Crockpot. Add sugar/spice mixture to Crockpot and stir well. Set Crockpot to medium. With the lid on cook nuts for 1 hour and 40 minutes, stirring every 20 minutes. Add water and stir well. Leave lid off and cook an additional 20 minutes. Remove from Crockpot and spread on a cookie sheet to cool. When nuts have cooled and are dry place in sealed containers such as jars or zippered bags. Mix Worcestershire sauce, egg white and nuts. Mix seasonings together and then mix with nuts/egg white mixture. Spread on slightly greased cookie sheet. Bake at 250 F for 45 minutes, stirring every 15 minutes. Let cool. When nuts have cooled and are dry place in sealed containers such as jars or zippered bags. I also got some Green Chili Almonds at Whole Foods (always wanted to try them). I plan to take some of each flavor to a Christmas party this year. Here is a recipe. I have not tried to make them yet. Mix all ingredients except nuts and let stand until sugar dissolves. Mix in nuts. After nuts are thoroughly coated spread on pre greased cookie sheet. Bake at 250 F for one hour stirring several times. Remove from oven and cool.